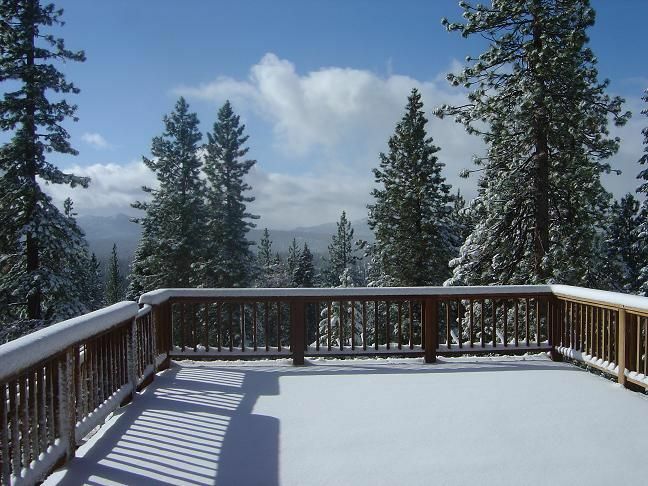 Enjoy Magnificent Views of Northstar and Peaks of Squaw Valley from this extra large enclosed sunny back deck. Enjoy the beautiful sunrise while you have breakfast or read the newspaper on the deck each morning. The deck is wonderful especially if you have small children or pets (All Enclosed). The house enjoys nearly all day sun! The home has been freshly painted. The home has approximately 1500 Square Feet of inviting living space with 2 bedrooms (master with King size bed & guest bedroom with one double - both in a beautiful log set), 2 newly remodeled bathrooms, a great room designed for entertaining with bar area and gas fireplace, dining room, kitchen newly remodeled with new granite counter tops and features a 48' Jennair Stove, pantry closet and laundry area. Sleeping sofa bed in the living room. It is situated on a quiet , flat Cul-De-Sac in the Wonderful Prosser Lake View Estates Neighborhood. Very easy winter access as well, flat driveway, quick in & out. The location is ideal.. 5 minutes from Hwy 80. The house sits back approximately 80 Feet from the street and is very serene. The two car garage is detached from the house. Summer time is a great time to visit and take full advantage of what Tahoe has to offer. It is just wonderful! Hiking, Biking, Horseback Riding trails are located all around the area, Prosser Lake and the Emigrant Trail are a few minutes away, a short drive will take you to lots of trail heads in Tahoe Donner where you can take a short stroll , long hike, trail run or mountain bike ride along ridges overlooking Donner Lake and the Donner Crest. Equestrian centers are close by. Access to pools and fitness center nearby also available for a daily fee. So much to do to keep you busy during your stay in Tahoe! And of course, Winter speaks for itself as Truckee is surrounded with so many Alpine Skiing Resorts. The Tahoe Donner Cross Country Center is also a 15 minutes drive and there are endless snowshoeing trails around. This home is located in a great location for winter, flat street, flat driveway, easy in & out! House is available for long term lease $3200 per month (12 months) + utilities and driveway snow removal., Wi Fi, Basic Cable TV, Telephone and weekly garbage pick up. Brand New 40" Flat Screen Television, one in each bedroom! We really enjoyed the house, it was very comfortable and a good layout for relaxing as a family. The views from the deck are fantastic. The location is also great as it was close to everything which made accommodating a lot of different family activities very easy. It is also a great place for your pets as our two labs loved the big open safe deck. I would definitely like to come back. We rented this house with another family for New Years, and had a GREAT time. The house was especially friendly to families with young kids (ours were ages 2-7 yrs) - it was well stocked (kitchen, linens, sledding gear), and we had just the right amount of space to accomodate our group without feeling like we were crowded or trying to track kids down. Lovely views off the living room/front deck. Nice neighborhood, conveniently located near downtown Truckee, and Northstar was a quick 15 min drive. Highly recommend for those looking for a cozy, easy retreat. We had 11 people in the house during the MLK weekend. Plenty of space for 5 kids to roam around. The location is perfect, 20 minutes from Sugar Bowl, about 5 minutes to the Safeway shopping plaza. Kitchen is stocked from cooking pans to coffee filters, even has a crock pot! There's also a DVD player, that was not mentioned in the listing. It is also very clean.